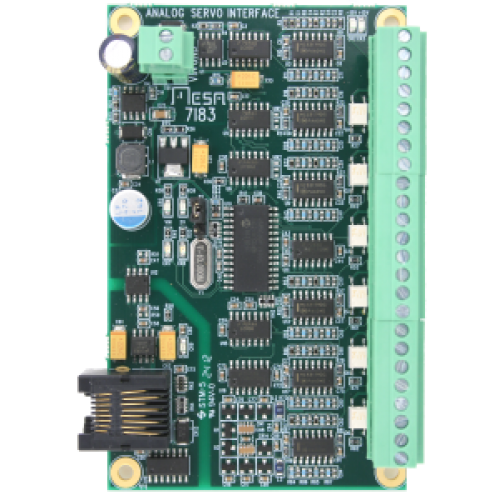 The 7I83 is remote isolated six channel +-10V analog output card intended for analog drive interfacing or other +-10V analog output applications. The analog outputs, drive enables and field power are galvanically isolated from the communications link. Analog outputs have 13 bit resolution and a 2.5 KHz bandwidth. In addition the six analog channels, the 7I83 has six isolated optocoupler outputs intended for individual drive enables. The enable outputs are rated 50 mA and up to 100V. The 7I83 is powered by a single 8-35V power supply. The RS-422 interface at 2.5 MBaud is compatible with HostMot2s SSLBP smart serial interface which can support as many as 32 7I83 cards for a total of 192 analog outputs with real time update rates up to 10 KHz. 3.5 mm screw pluggable screw terminals are used for all isolated I/O.